Chapman Architects feel honoured to have been involved in the biggest transformation of Abbey Road Studios since its opening 86 years ago! The changes culminated in Abbey Road winning the prestigious ‘2018 Studio of the Year Award’ at the Music Producers Guild (MPG) Awards, which was the result of excellent team work between ourselves and specialist acoustic engineers ‘Munro Acoustics’ and also Abbey Road’s own technical team. A new autonomous Dolby Atmos Studio which will adjoin No.3 Abbey Road and will be sited within the existing courtyard and garden area. This accommodation consists of a new double height studio space, or ‘theatre’ specially designed and built to mix, produce and record for an immersive 3D Dolby Atmos sound. It has been designed to meet a strict and specific acoustic requirement. The studio is clad in facing brickwork to match the existing buildings, and will now have access to both the garden and the existing café. The courtyard garden has been transformed as part of high quality hard and soft landscaping scheme to compliment and accommodate the new studio extension. These works involved internal improvements to upgrade Studio 2 and to integrate the existing arrangement of rooms that were isolated from the main studio. A suite of new rooms link into the studio to include a new lounge area, now adjacent to the control room, and two new recording isolation booths, one of which can be divided again, to create yet another separate space. Visual links have been improved in this area to offer a more interesting aesthetic. The works to this studio involved remodelling the existing studio between Studio 3 and the front editing suite, now named ‘The Front Room Studio’. This provides a small recording booth and control room for the Front Room and a reduced sized recording booth for Studio 3. The garage studio works converted the existing garage into flexible and high quality production suites, included reinstating the drive way gates on Hill Road and creating an entrance and circulation stair core space, at the Hill Road end of the building. The works also included a new toilet and kitchenette to serve the new production suites, and the flat roof was replaced by a pitched roof with skylights, in line with the original building. The studio ceiling follows the line of the rafters, which creates a large open studio space. The internal refurbishment works also included the upgrade of the existing acoustic / sound insulation within the building. 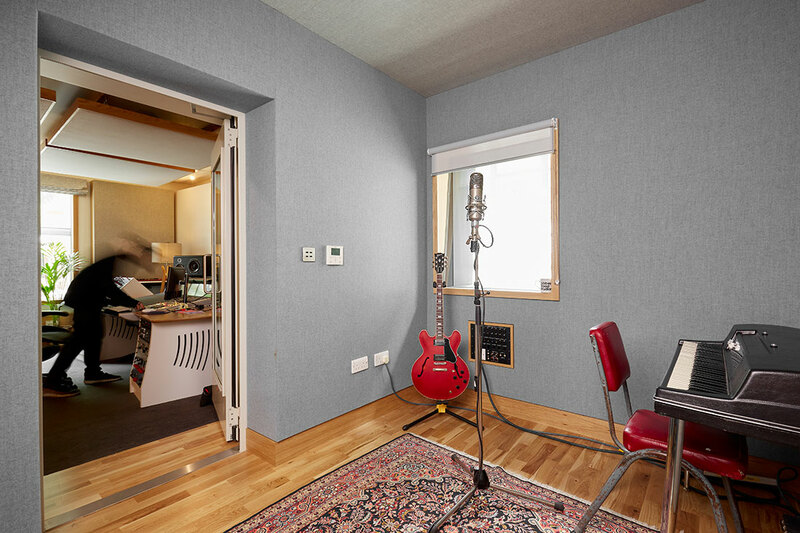 The works to The Gate House Studio included the conversion of the existing editing suites into a flexible and high quality recording space with a control room. The existing roof was raised and a new sky light was added over the space and the acoustic / sound insulation of the building was upgraded to ensure the best production sound quality was achieved. The external envelope was rendered and glass canopies were installed which also extend over the new cycle storage area. The existing access ramp levels were modified to create an accessible entrance. Chapman Architects are designers whose experience, sector expertise and creativity has delivered a unique portfolio of buildings and environments. Kiln Theatre: The show must go on!